Cottage "Gostinna Sadiba" is located on a spacious well-groomed territory at a distance of 300 m to Lake Svityaz. Standard rooms are located in a 2-storey house and a detached house (4 rooms for 10 people). In addition, you can order food or prepare yourself in the equipped kitchen. Cottage "Gostinna Sadiba" offers services for tourists: pond for fishing (included in the price), 5 arbors, 4 barbecues, children's playground, parking (for 6 cars), swings, beds. In the yard there is a well with drinking water. Distance to Shatsk - 4 km, Kovel - 90 km. 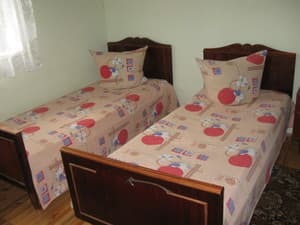 Description of the room: One room with an area of ​​19 sq.m is equipped with two single beds. 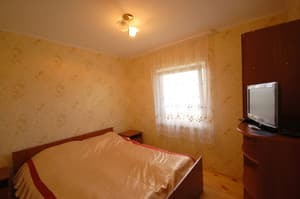 Description of the room: The four-room cottage with an area of ​​120 sq.m consists of 3 bedrooms (double bed), living room (sofa, fireplace), kitchen for self-cooking. Terrace for rest. In addition, you can order food or cook yourself in the kitchen. Cottage "Gostinna Sadiba" is located at a distance of 300 m to Lake Svityaz. Distance to Shatsk - 4 km, Kovel - 90 km.